UK wheat has traded in a narrow £1.50/T range since last Thursday on the May-19 LIFFE futures contract amid a lack of fresh news and despite the Sterling reaching its highest level against the euro since the end of May 2017 last Friday. However due to this week’s Commons vote which is said to increase the risk of a no deal scenario according to EU Chief Juncker, the pound could not keep momentum. Less than 60 days left until Brexit and many hurdles still need to be overcome. 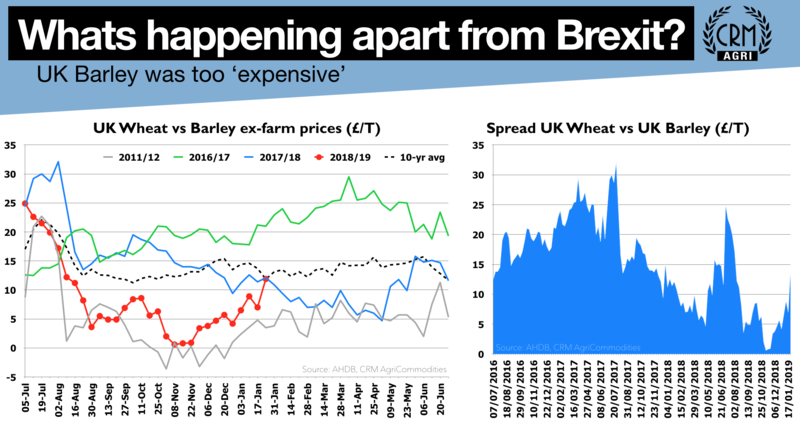 Amid ongoing strong UK maize imports which were standing at a record of more than 1MMT at the end of November 2018, feed barley continues to be under pressure. At parity to feed wheat in November, it is now trading back to its 10-year average discount of nearly £12/T meaning it is below the £160/T mark for the first time since early August ie cheaper than imported maize. The trade is pushing had for farmers to make additional sales in the wake of the ‘Brexit’ uncertainty, maize being ‘cheap’ and a very promising 2019 crop. Although true, we would also consider that there are still 5 full months remaining in the 2018/19 campaign whilst the weather market for new crop is still ahead of us and stocks far from comfortable.